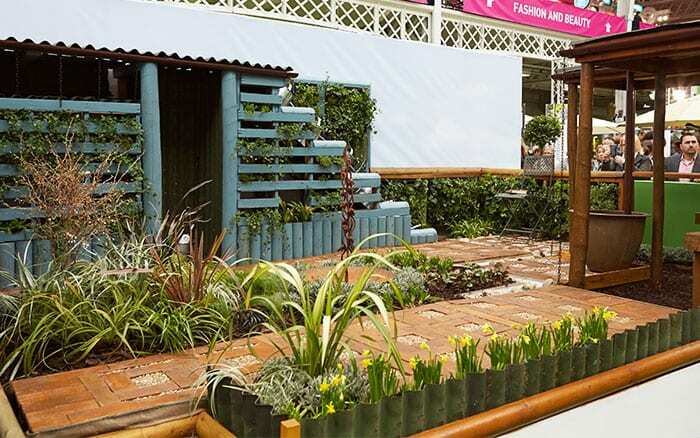 The stunning show gardens built by the students from the Young Gardeners of the Year competition are an inspiration. 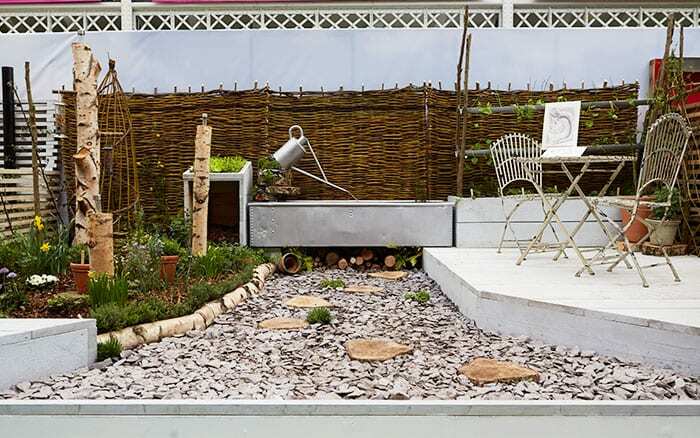 See the best design ideas from each garden to make the most of small garden spaces. 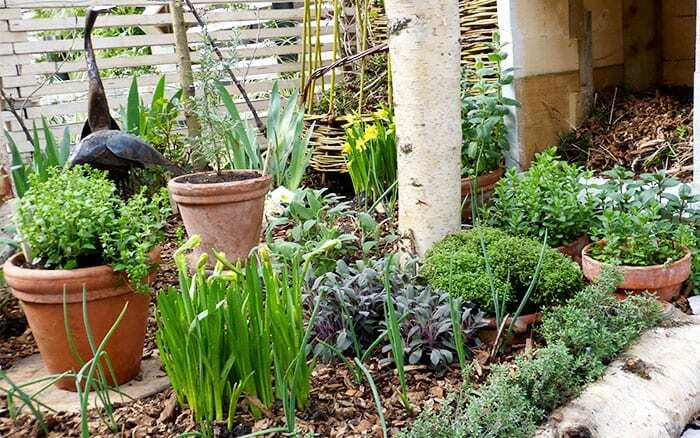 A good tip for small gardens is to use different levels. It makes the garden appear considerably bigger. You step up into a raised area by the water feature and then down into the sunken seating area. I loved the lighting and the use of Edison bulbs. It casts a soft, glowing light in certain areas of the garden to highlight features. Plus the striking bulbs and filaments are a feature in themselves. 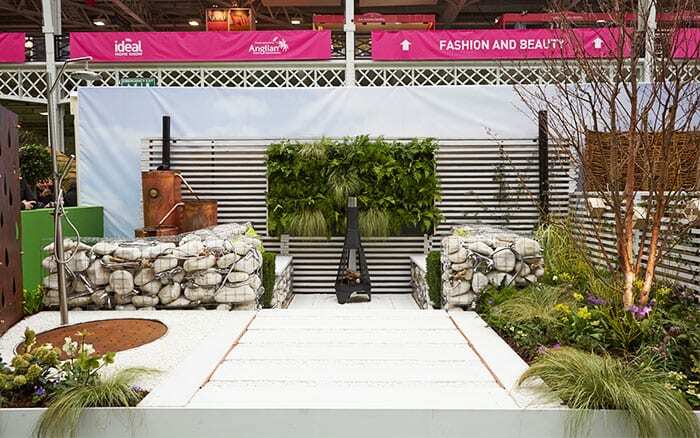 The students made clever use of black Millboard decking for the walls. 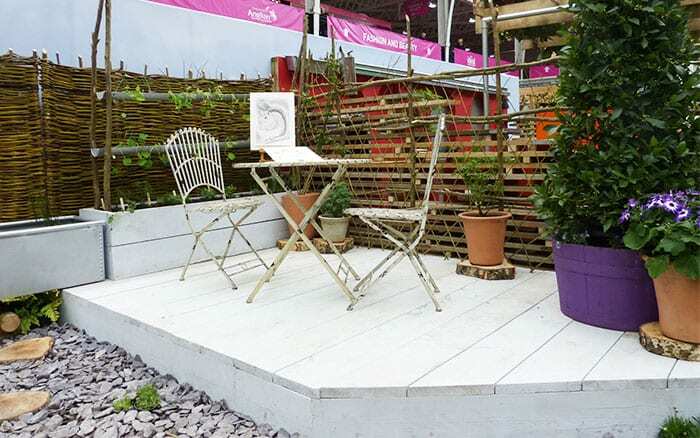 Composite decking is made from recycled materials rather than wood, and can last for years. 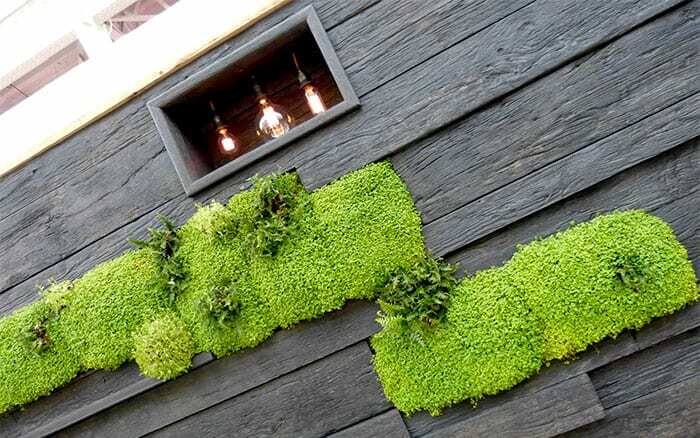 They also built in recesses for lighting and planting, which is a great way to make the most of wall space. 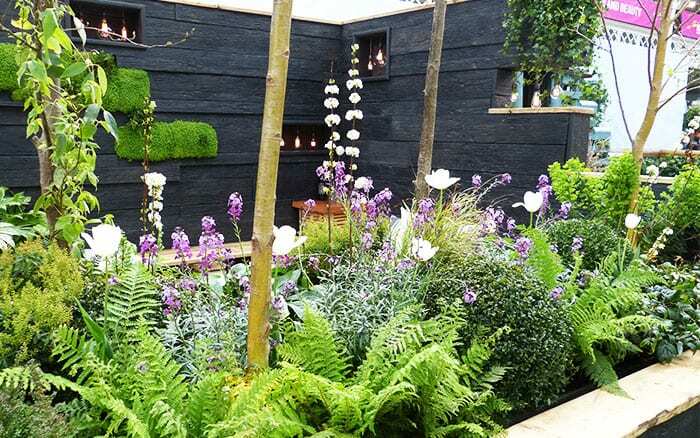 Create drama in a small garden with contrast between light and dark colours. The walls are dark but the path and paving is much lighter. I also like the water harvesting element. When rainwater falls on the garden, it is collected and works its way around the whole space. It powers water features and fills reservoirs that can be used to water plants. If you want to reduce your dependence on mains water, it’s a great design trick. 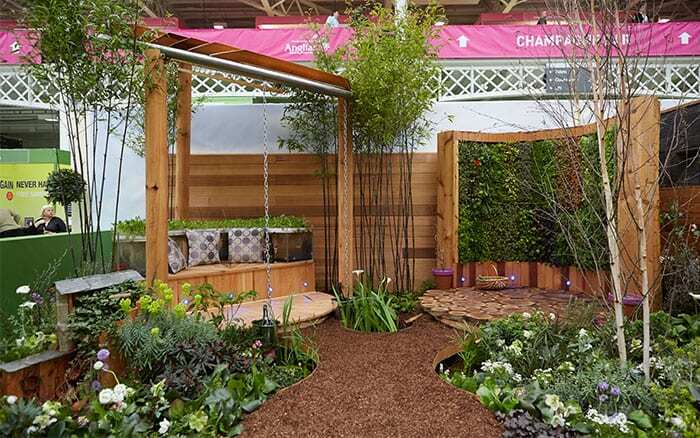 Find out more about Writtle’s garden here. This garden featured a lovely covered seating area. The pergola has shutters that you can open and close. This gives you the option of having more shade and shelter, or opening them up to let more light in. 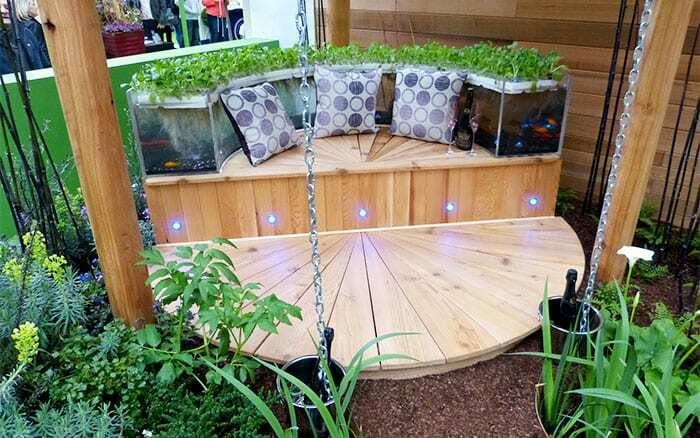 The curved fish tank around the seating area is also a brilliant feature. 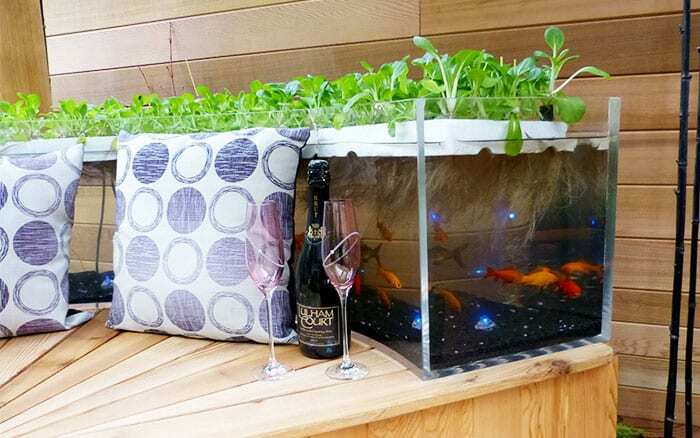 It’s clever to build it into the seat, and it is lovely to sit there and watch the fish. 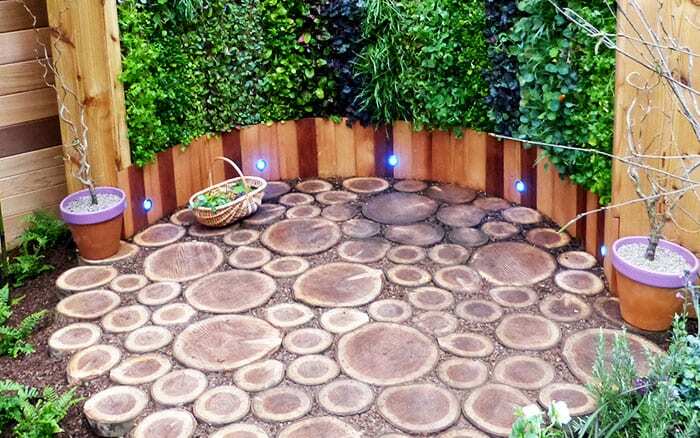 The use of curves and circles in the garden also helps to prevent the space from becoming too boxy. The students created striking flooring with sliced sections of wooden logs. You can buy log slices to achieve this look at home if you don’t want to cut them yourself. It looks amazing and continues the circle theme well. This garden is also great for little features that make a big difference. One is the quirky high heel bird feeders. The food mix is placed in the toe and the back of the shoe protects it from rainfall. They are attached to the wall by the heel – it’s good fun. And the rain chains make a great feature too. They work with the guttering to transport rain from the pergola roof to the floor. This means you get a nice trickling sound instead of dripping water. See more about Pershore’s garden here. I really like the use of height in this garden. It’s a simple way to make a small garden feel bigger. 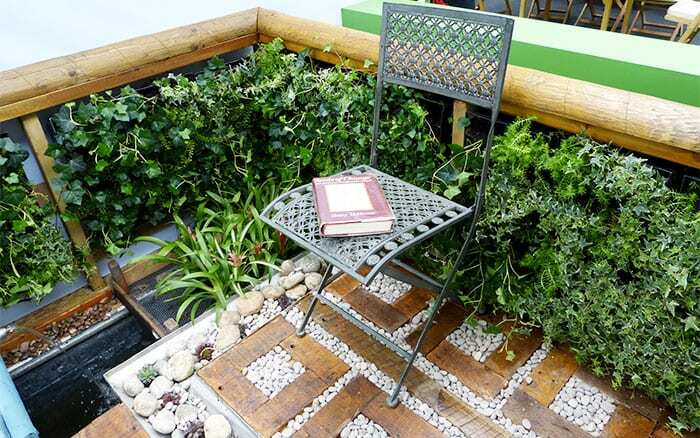 Students used scaffolding to create a raised entrance into the garden. 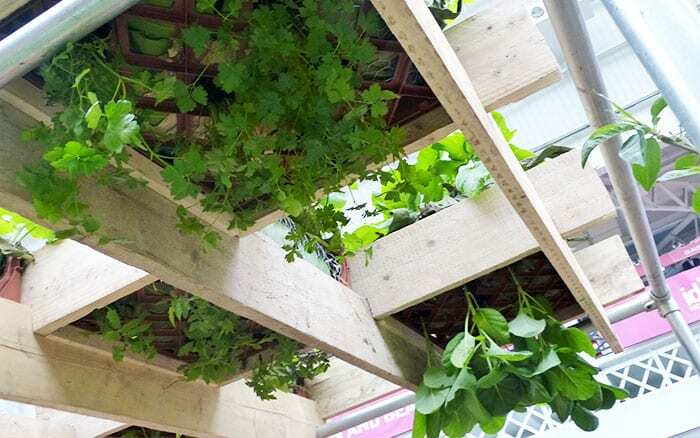 And on top they planted edible crops, hanging down from suspended planters to make the best use of the space. The bold colour scheme is also really striking. The red and yellow colours open up the space and make it feel bigger than it is. One of the best features is the kitchen area. 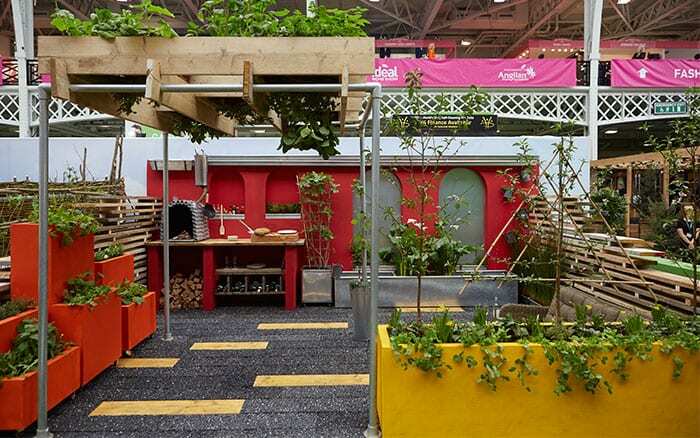 A working kitchen is great fun in a garden, and ideal if you want to use it for entertaining friends and family. 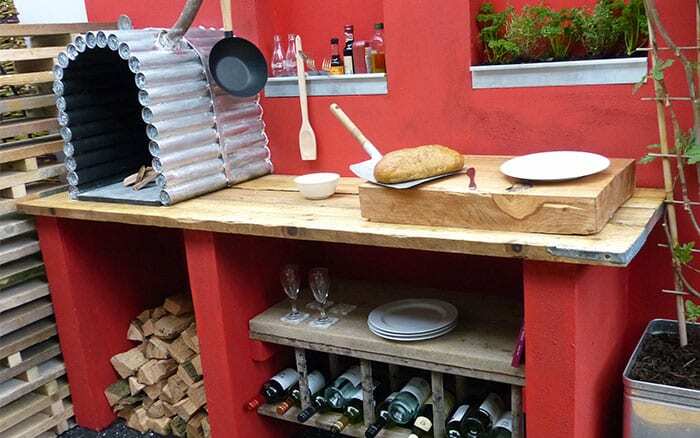 This one has a pizza oven too! The worktops are an important addition to create enough space to prepare food. 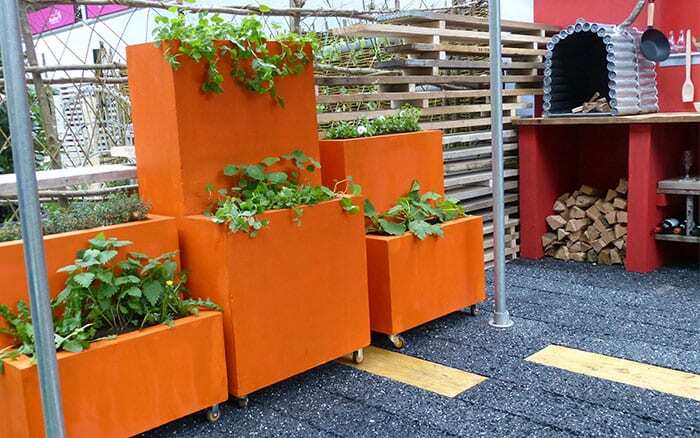 This garden is also really flexible because the pots and planters are on wheels. This means you could easily move them around the garden, to change how it looks and free up more space. Finally, the students made great use of recycled scaffolding boards. They stacked them flat with blocks of wood in between to create a striking boundary fence. Find out more about Askham Bryan’s garden here. My favourite part of this garden was the watering can waterfall. It is fed through the guttering from the garden building structure. This means that as it rains, the watering cans flow into one another. You can also put in a pump to push the water around to make it into a water feature. The planting in this garden is very striking and low-maintenance. The grasses and phormiums create structure and architectural feel. There are also plenty of evergreen plants to make sure the garden looks lush all year round. I also love the fact that everything is recycled. The wood, timbers, corrugated iron – most of the materials in the garden. 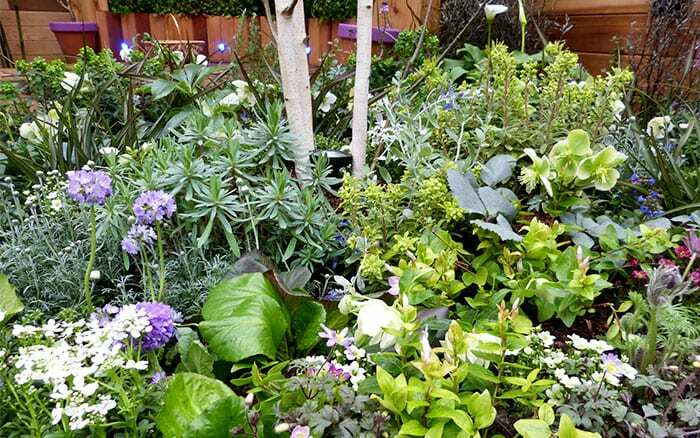 It’s a good way to reduce landfill and create a garden on a budget. 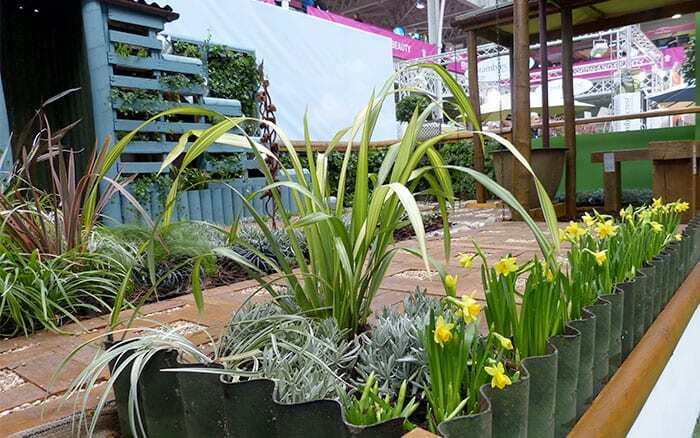 Pick up materials from recycling centres and reclamation yards to try this at home. The corrugated iron is used to good effect too. It makes a simple roof for the garden building and to shield the seating area from rainfall. They also cut some off and used it as wavy edging for the flower borders. Repeating materials in different places helps to keep the garden design cohesive, which is very important in a small garden. I also like the use of old wooden pallets as flooring. The students cut them up, sanded them down and stained them to create a recycled parquet flooring. 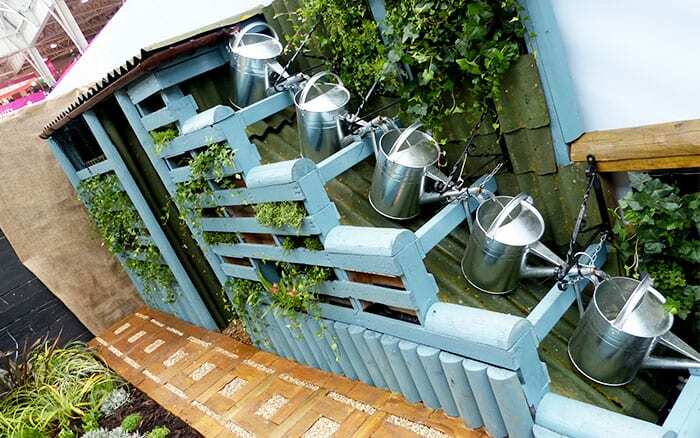 It’s a cheap and clever way to create an otherwise expensive garden feature. Find out more about Chichester’s garden. 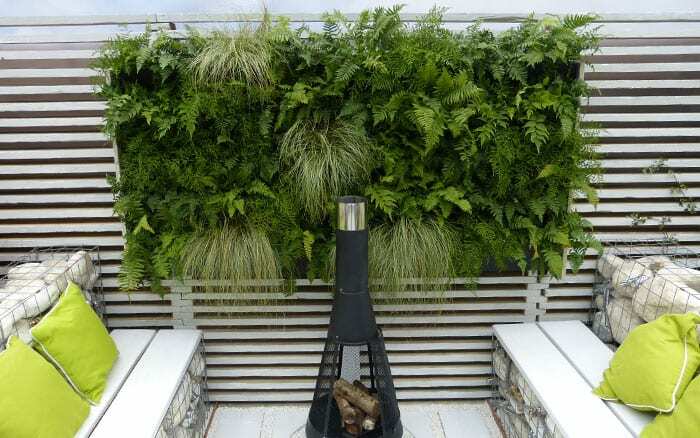 The vertical wall planting feature is incredibly striking. As soon as you enter the garden, you can see this lush green wall surrounded by white. It’s a great way to get greenery a little higher in the garden. I also like the light flooring. Pale colours make a garden feel bigger and more open, and the white paving and gravel here make it feel much larger. The design is fairly symmetrical, which suits the clean lines and classic white colours. It benefits from a strong focal point in the centre, created by the heater. It always helps in a small space to have one central focal point which draws the eye. 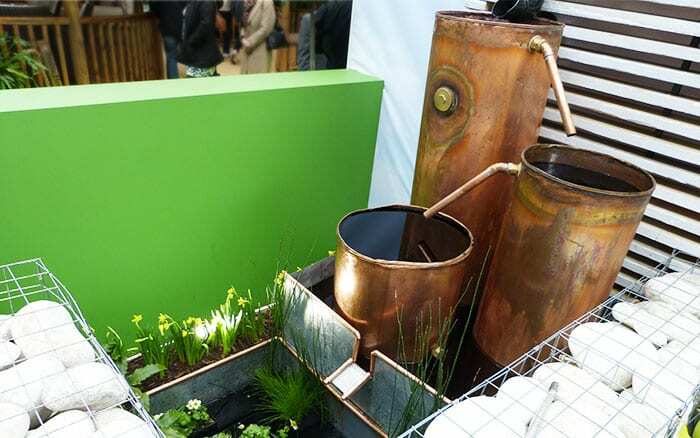 Another good idea is the quirky copper boiler water feature. 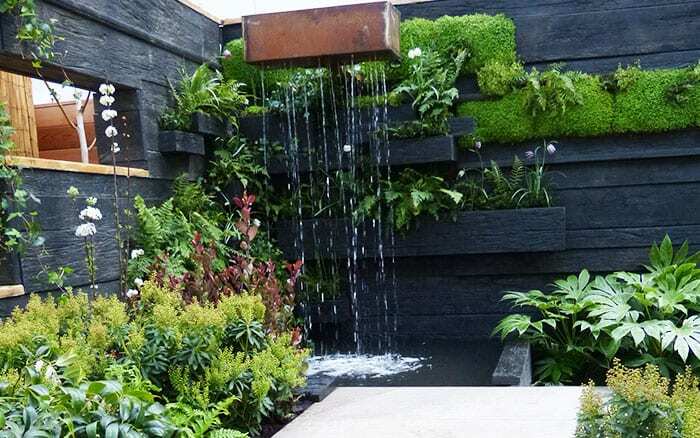 It’s a clever way to use water in the garden and create movement. Making a water feature from recycled materials is also a clever way to get the features you want without spending too much money. 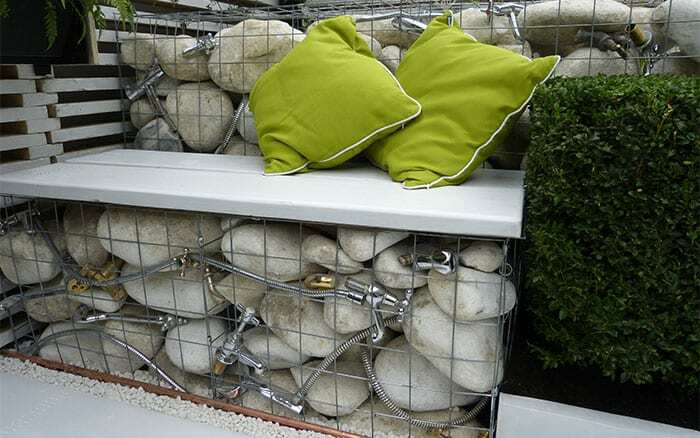 Finally the gabions filled with white boulders and the unusual recycled plumbing materials create real interest. Some of the space has been filled with plants, and you could continue this until they were almost covered. Did you know gabion comes from the Italian gabbione, meaning cage? You do now. Find out more about Capel Manor’s garden here. This garden has plenty to offer wildlife. I really like the bee habitats everywhere. Most of the timber in the garden had little holes drilled into it, which is ideal for solitary bees. 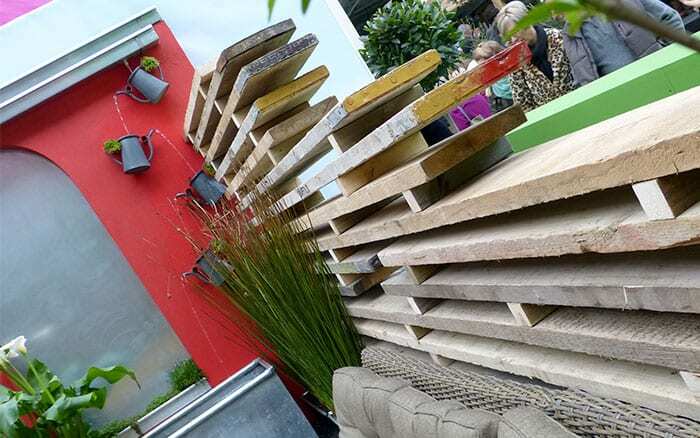 Students made good use of timber in the garden too. The birch log edging for the border was very striking, and I love the effect the silvered bark gives. Almost everything in the garden has been reused from the grounds of Shuttleworth College. 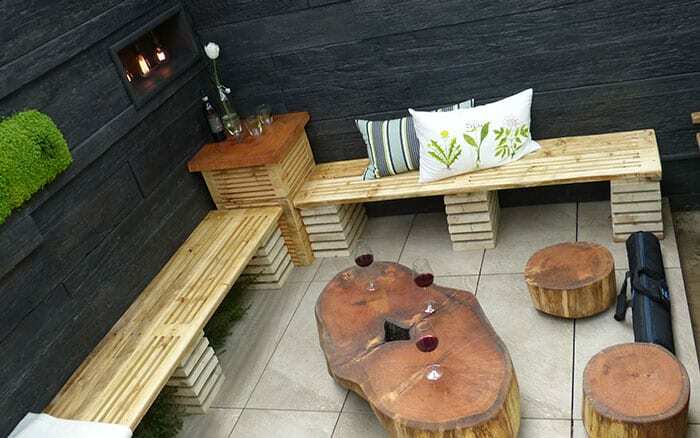 The recycled decking is also clever design. 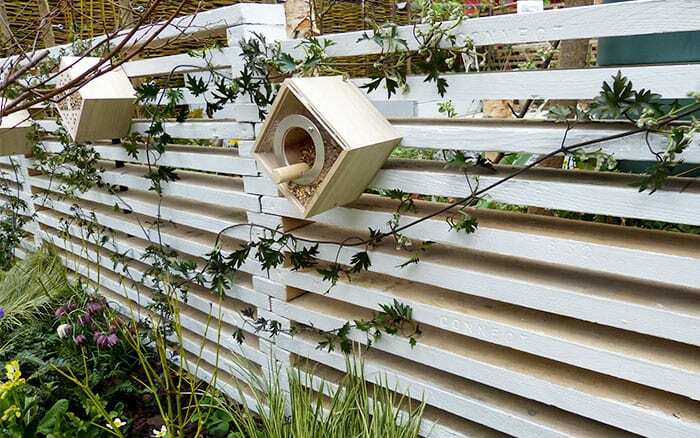 Reusing wood helps to save money when you are building a garden. Plus it gives the space a charming, rustic feel. 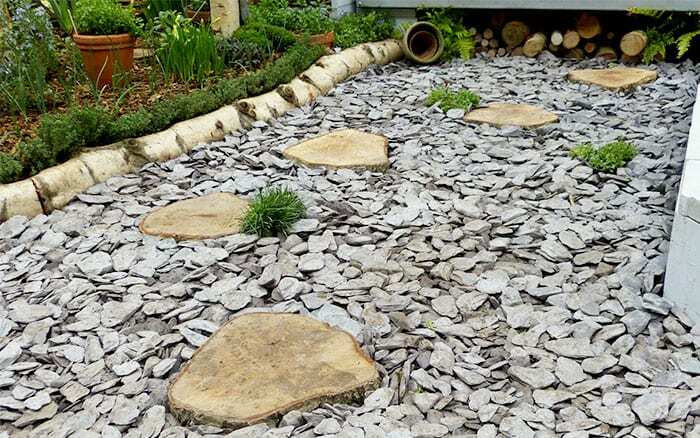 They also used wooden logs as stepping stones, which were set among relaxed slate chips. The combination of the two materials is very striking. Finally, the natural fencing is another strong feature. 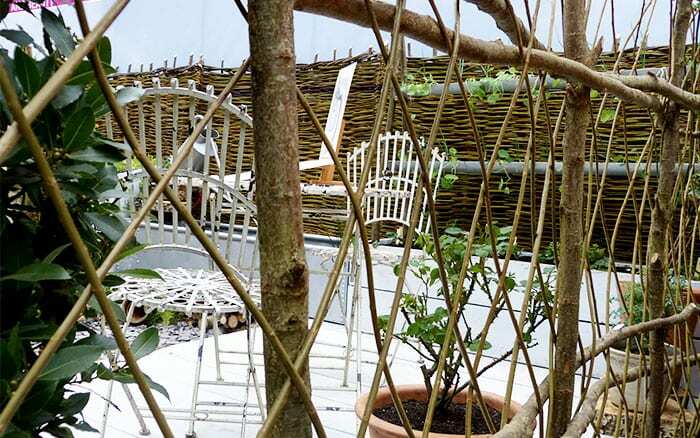 The interwoven branches give a soft woodland theme to the garden and open up the space. 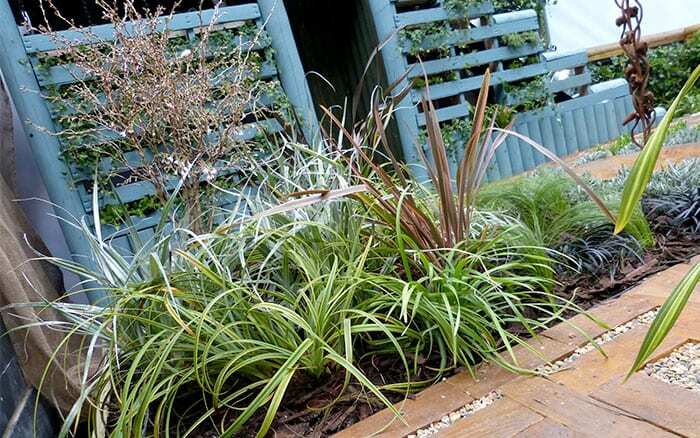 It’s a good way to create a boundary without cutting into your planting space. Find out more about Shuttleworth’s garden here. I hope this has given you some garden inspiration! 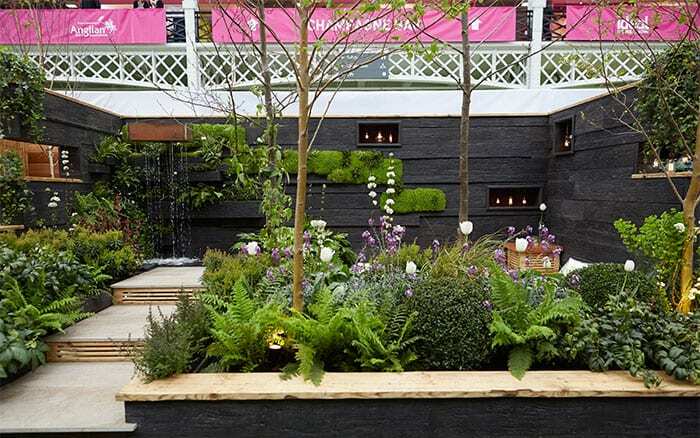 Find out which of these gardens won the coveted Best At Show trophy here. awesome post, these pics are so inspiring, I will try some ideas in my garden this summer.